Last week, I went to City Hall to drop off a red plastic container of used hypodermic needles. One of our cats, Snowflake, was recently diagnosed with diabetes, so since January we’ve been giving him twice-daily insulin injections. Used syringes (or “medical sharps,” as they’re officially known) are a health hazard and can’t be tossed in the trash, but the local Health Department accepts puncture-proof containers of used needles for safe disposal. It took a lot of wandering inside City Hall to find the Health Department: the building is literally a bureaucratic maze. 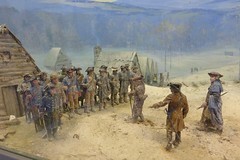 Newton’s City Hall also doubles as a War Memorial, so while I was lost and wandering, I had ample opportunity to admire the dioramas in the hallways, each depicting in miniature a significant scene from American military history. 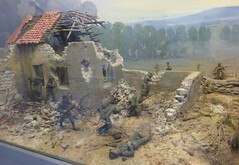 Dioramas are like windows into another time or place, depicting a particular moment frozen in time, but they are also a kind of box, cleanly containing a discreet moment that exists separate and apart from the present. 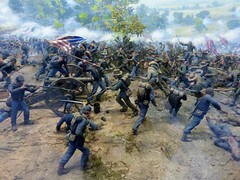 Viewing miniature models of soldiers dying on the battlefields of Gettysburg or France, for instance, I can imagine what it was like to be there…but I’m not there. The pane of glass between me and a diorama scene safely contains the story it depicts, so I can peer into the box of another’s pain without having to touch it. Once I found the Health Department, I was surprised I didn’t have to fill out any paperwork or show identification to prove I’m a resident. Instead, when I announced I had medical sharps to dispose, a man silently rose from his desk and barely made eye contact as he solemnly walked me down the hall to a locked closet where a large, deep box—large enough to curl up in—was filled to almost-overflowing with red biohazard canisters and used detergent bottles, each filled with puncture-points of pain. After adding my contribution to the box, I got to wondering about its contents. 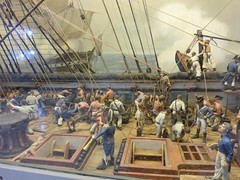 The box, like a diorama, was both a window and a container. As a container, it safely held sharp, potentially infectious things that need to be handled (and disposed of) with care. But as a window, the box offered a glimpse into the pain of my anonymous neighbors. Behind each needle-prick lies a story of suffering: patients and caretakers, sickness or addiction, pain and relief. Maybe this is why the man with the closet key averted his eyes, in part to preserve my privacy (needles freely accepted: no questions asked) but also to protect the sanctity of an unshared story. The diorama of daily life contains so much suffering, a jaw-dropping accumulation of countless pricks and jabs. Who among us has the courage to look it in the eye? 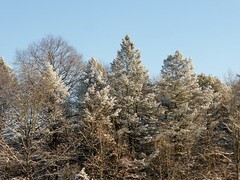 I got stuck in traffic on my way to Curry College this morning, so while I sat in my car on Interstate 93 waiting to exit onto Route 138 in Canton, I shot a handful of photos of the dusting of new snow on nearby evergreens as well as the snowy summit of Great Blue Hill: a landmark I pass every time I drive to Curry, but I seldom slow down and study. 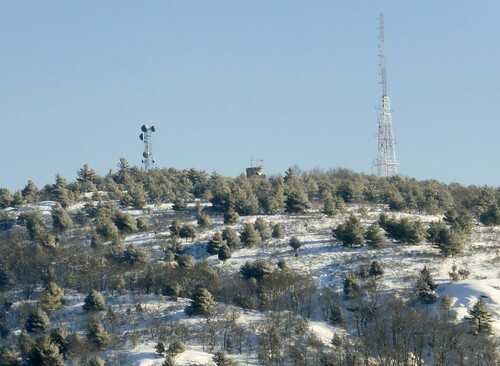 Years ago when I lived in Randolph, I used to regularly climb to the summit of Great Blue Hill, parking at the Trailside Museum and taking the Red Dot trail to Eliot Tower and beyond. Eliot Tower affords good views of Boston, and if you continue further on the Skyline Trail, the views are even better, the wind-swept patches of exposed granite making you feel as if you were atop a mountain rather than a hill. In the summer, I’d hear prairie warblers singing atop Great Blue Hill, as the short, scrubby trees there are their preferred habitat. Prairie warblers have a distinctive buzzy song that ascends the chromatic scale: a song I’ve never heard anywhere else and thus associate exclusively with Great Blue Hill. How far the mind can wander while one’s body is stuck in traffic, thoughts ascending up the chromatic scale like a brilliant buzzing bird. I’m currently reading Lynda Barry’s Syllabus: Notes from an Accidental Professor, which I’d requested from the library a few months ago after reading a review that sparked my interest. 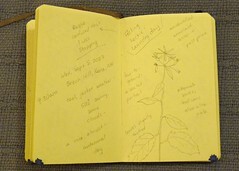 Barry teaches an interdisciplinary course on creativity at the University of Wisconsin, and Syllabus contains her hand-drawn notes, assignments, and other course materials. When I picked up the book from the library last week, I immediately flipped through it, captivated by its hand-drawn, doodle-like appearance. 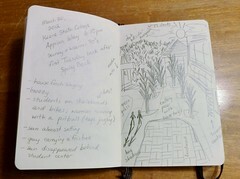 The book looks and feels like a well-worn composition book–the kind with black-and-white cardboard covers you can buy at nearly any dime store. I know this kind of comp book very well because I used to write in them before I switched to Moleskine notebooks, which are sturdier, more expensive, and ever-so-more serious. Moleskines are what I use now as a Serious Writer, but black-and-white cardboard-covered comp books are the familiar and unassuming standby that many of us started out with: comfort food for the creative soul. I’m loving Barry’s book and have already bought my own (back-ordered) copy on Amazon, as this is one of those books I’ll want to read and re-read even after I’ve returned my library copy. 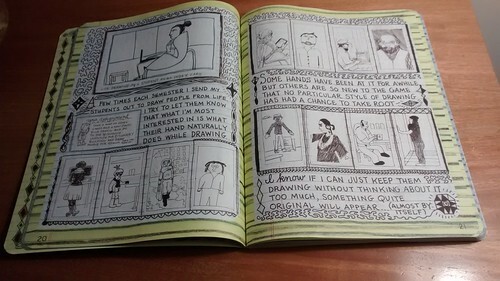 In Walden, Thoreau wonders “How many a man has dated a new era in his life from the reading of a book,” and I suspect Lynda Barry’s Syllabus will be one such book for me. Julia Cameron’s The Artist’s Way was a book like this, and before that, so was Natalie Goldberg’s Writing Down the Bones. Both books helped shape me as a creative person long before I actually saw myself as being creative, and they did so by giving me a practice (not just a philosophy) to exercise that creativity. 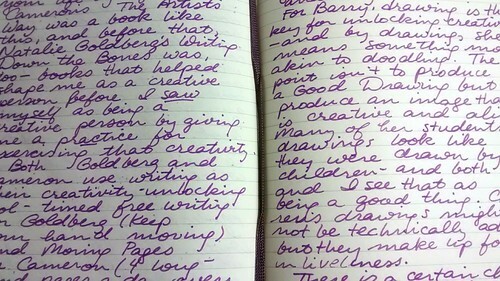 Both Goldberg and Cameron use writing as a tool to unlock creativity: timed free-writing for Goldberg (with the admonition to Keep Your Hand Moving) and morning pages for Cameron (with the insistence that you hand-write your pages first thing in the morning). I’ve been doing some modified version of free-written morning pages for years, since first encountering Goldberg and Cameron, and the results have been revolutionary. You have no idea how much have to say until you actually sit down and start saying it. 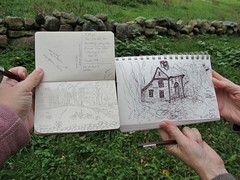 For Barry, drawing is the key to creativity–and by “drawing,” she means something more akin to doodling than Serious Art. The point isn’t to produce a “good” drawing but to produce an image that is alive. Many of her students’ drawings look like they were drawn by children…and both Barry and I see that as being a good thing. Children’s drawings might not be technically advanced, but they delight with their lively lack of inhibition. There is a certain charm in things made by hand, and Barry captures that in Syllabus. By requiring her students to use inexpensive supplies such as index cards and dime-store composition books, she eliminates the pretension and self-importance we often associate with Art. If you’re drawing a two-minute self-portrait on an index card–something Barry asks her students to do at every class session as a way of taking attendance–you aren’t trying to create a masterpiece; instead, you’re trying to (quickly) capture the mood of the moment. 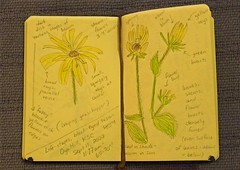 Many of the drawings Barry includes in her book were “rejects”–that is, drawings her students left behind because they presumably weren’t good enough to keep. But to my eye, even a rough, technically imperfect doodle done by hand has an immediacy and charm that more than makes up for any technical flaws. These doodles are like people: you don’t love them despite their imperfections but because of them. Just as the simplest home cooking is more satisfying than a pre-packaged meal, even the most primitive hand-drawn images have a warmth of personality that is lacking in a photograph or polished painting. There is, it seems, a simple magic in making something by hand, whether you’re chopping vegetables, scribbling words, or doodling images in a well-worn composition book. The top photo shows the first draft of this post, which I wrote by hand in my journal. The second and seventh photos are images from Syllabus itself, and the other photos show you previously-blogged images from the nature journal I used to keep when I taught a first-year Thinking & Writing class called “The Art of Natural History” at Keene State College. 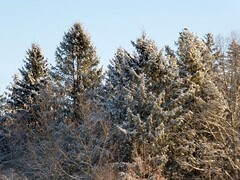 Yesterday there was a white-breasted nuthatch perched in one of our backyard trees, motionless and fluffed against the cold. I was unloading bags of ice melt I’d bought in advance of our latest storm, and the nuthatch was clearly watching me: not moving, just softly tooting as if talking to himself. 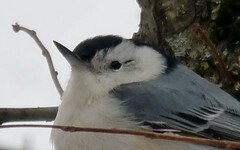 I got my camera out of my purse to take a picture, and the nuthatch didn’t move. 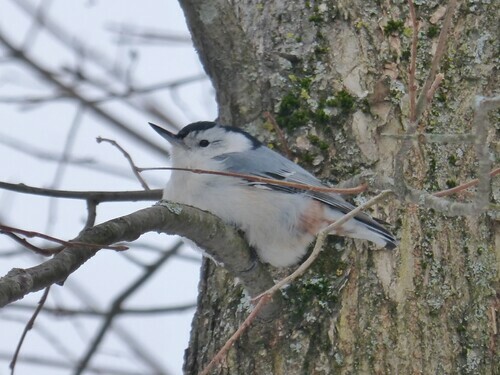 I took a few zoomed-in pictures, and the nuthatch didn’t move, so I stepped in closer and took more photos–and still, the nuthatch didn’t move. I eventually returned to unpacking the car, and the nuthatch eventually flew away, off to do his birdy business. But for a few expectant moments, that nuthatch and I shared a face-to-face encounter: Hello, whatcha doing? 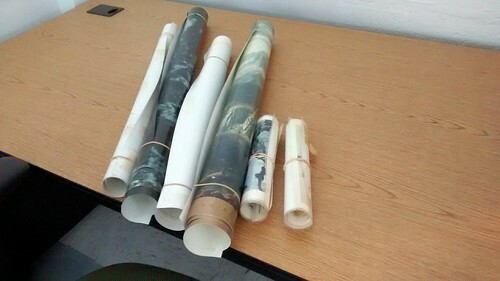 Yesterday I brought a roll of posters to my office at Framingham State: posters I hadn’t seen since I took them down from the walls of my old office at Keene State some three years ago. Some of these posters I’ve had for decades, like a series of Korean watercolor prints depicting the four seasons my ex-husband bought when we lived in Toledo more than 20 years ago. I also found (and promptly taped to my wall) a promotion poster for a stage adaptation of Willa Cather’s O Pioneers! 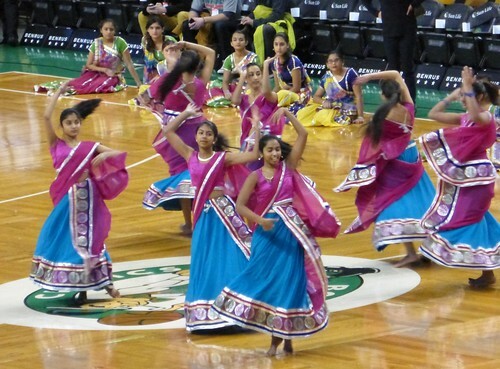 I saw at Saint Anselm College when I taught there in the early 2000s, something that feels like a lifetime ago. Unrolling these posters felt like opening a time capsule containing my own personal history. All of these items are things I chose to put on my office walls over the years, so they all have some sort of connection with my life history. Ironically, though, I didn’t remember many of them until I removed them from the cardboard shipping tube I’d stored them in, memories spilling out as I unrolled each one. There is, for example, a print of Van Gogh’s sunflowers that I bought when I was a grad student at Boston College. It hung in my office in Carney Hall when I first started teaching, and I chose it largely because its earth tones complemented the dated ’70s decor of that office, which featured harvest-gold walls and an avocado-green desk and chair. I somehow managed to keep and carry this poster from one office to another, but I have no idea what became of the print of The Painter’s Honeymoon I used to take down from my office wall to tape to the blackboard in my classroom and ask students to write about. That lushly romantic image also complemented the gold and green decor of my first office, but I either jettisoned or lost it over the years. Also on my wall is a double-fold magazine ad featuring a doleful-eyed dog in the process of eating someone’s homework. This artifact dates from roughly the same time as the Van Gogh print: I think I first displayed it in my grad-student office at Northeastern when I started my doctoral studies there. It’s a poster I’ve taped up and taken down countless times in my 20-year career as an oft-itinerant adjunct instructor, and it strikes me as remarkable that a simple magazine ad could have such staying power. Among the posters I’d forgotten and then found was an enormous movie poster for A River Runs Through It, which I’d bought and hung on my office wall when I was a PhD student, one of my dissertation chapters focusing on Norman Maclean’s novella of the same name. The poster shows Paul Maclean–played to mischievous perfection by a young Brad Pitt–casting an impossibly long fly-line, its trajectory sun-lit and frozen in time. “Nothing perfect lasts forever except in our memories,” the tagline wistfully observes, and this remark would have served as an apt epigram for that dissertation chapter, which compared Maclean’s novella with Henry David Thoreau’s A Week on the Concord and Merrimack Rivers: two books about rivers that commemorate dead brothers. 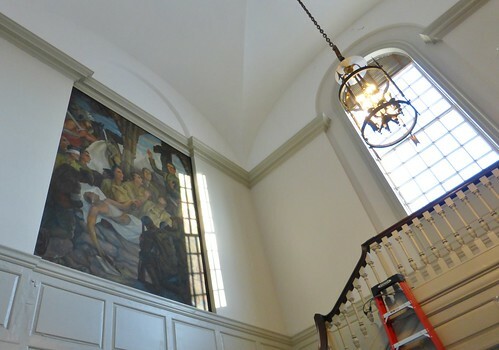 It’s been more than 10 years–more than a decade!–since I finished that dissertation, and I’ve forgotten much of what it was about, the work I do as a teacher of writing having little to do with my academic training as a literary scholar. It doesn’t really matter, though. The river of time rolls on whether you’re ready or not, with some things getting lost or jettisoned and others being preserved. Like that movie poster likes to remind me, nothing perfect lasts forever except in our memories, and our most precious memories don’t mind being tightly rolled and stored away. 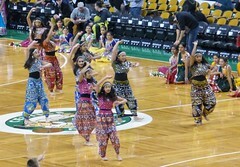 Back in December, dancers from the India Society of Worcester performed before a Boston Celtics game J and I attended. 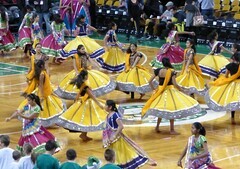 There were several troupes of dancers, each dressed in colorful, flowing skirts or loose-fitting, spangled pants. As the dancers twirled to uptempo music, I shot photo after photo, knowing there would come a point later in the winter when I’d be so tired of a monochromatic palette of Overcast and Snow, I’d cherish any spot of light and color. We’ve officially reached that point. As I type these words, both darkness and snowflakes are falling, with a blizzard forecast for tonight into tomorrow. For the fourth time in so many weeks, J and I are hunkering down, hoping we don’t lose power and knowing we’ll have to dig out once again when the storm is over. 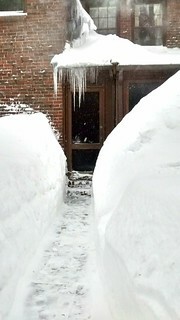 The snow in our yard is waist-deep, and I wonder when we’ll see our buried lawn again: sometime in April? Every winter, I find myself relying upon a tried-and-true handful of coping strategies to stoke the inner fires: anything to get myself through these doldrum days. I wear a bright pink coat because the color cheers me, and I like to imagine myself as a bright beacon in a season when most folks wear black or other shades of dark drab. I don’t scrimp on footwear, knowing I’m far happier when my feet are warm and dry: the pricy Huntress Wellies I’ve been clomping around in most of the winter have been worth every penny. And I know to use music as a kind of medicine, listening (and dancing) to salsa on Pandora as I do my morning chores and pulling out the big guns–not one but two Bellydance Superstars CDs–on my dreary, gridlocked drives to and from work, the grocery store, or other errands. 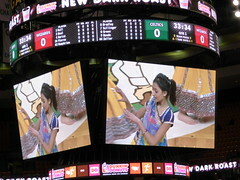 Such upbeat and exotic music helps me imagine I’m someplace warm and colorful, and I can imagine myself barefoot and shimmying in a bright, jingling outfit rather than waddling flat-footed in boots and a bulky coat. 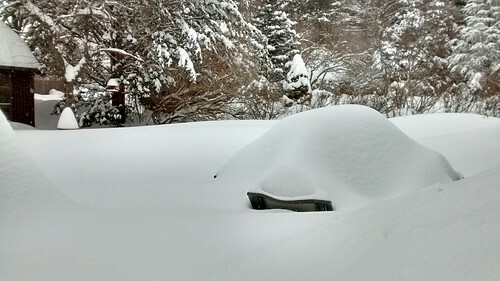 Remember that photo of our patio table and chairs I posted in January, after winter storm Juno dumped a foot and a half of snow in our backyard? As of this afternoon, that table had been completely covered in snow from winter storm Marcus, and more has fallen (and continues to fall) since then. Both yesterday and today, J spent a few hours in the afternoon raking snow from the roof and snow-blowing the sidewalks and driveway, and I shoveled the areas the snow-blower can’t reach, like the front and rear entryways as well as the gate to our backyard dog pen. Both yesterday and today, I brushed about a half foot of snow off my car even though we have nowhere to go: J and I stayed close to home yesterday and today, and tomorrow I have another snow day from teaching. We’ll have to do it all over again tomorrow, after the snow has finally stopped falling, and after the plows have made their final pass down our street, leaving a tall wall of white at the base of our driveway. We’ll have to roof-rake, snow-blow, and shovel again tomorrow, but at least for one brief moment this afternoon, J and I felt like we’d made a (temporary) dent in the ever-accumulating snow piles. 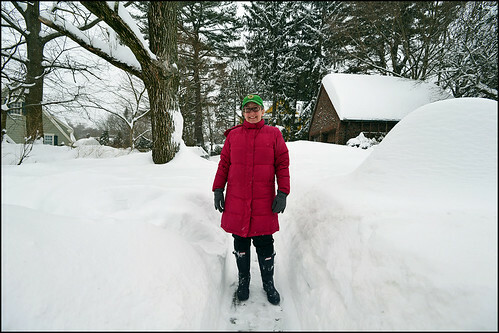 That’s me standing on the sidewalk J dutifully cleared this afternoon, three weeks’ worth of storms leaving us with waist-deep drifts in our backyard…and we’ve gotten even more snow since then.